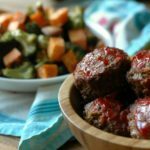 A nourishing, nutrient dense meatloaf dinner in weeknight fast prep time! I see you taking the time to navigate teen friendships, homework, and activities. YES balance is good. Yes sometimes things need to be trimmed to make priorities happen. But I also get that we all can’t stay at home all day and be in the kitchen. We all can’t quit a job that is paying our bills to make sure healthy dinners are on the table every night. And I’ll be the first one to stand up for the stay at home mom to say that it isn’t just playing dress up with babies all day and dollies with toddlers. No one can do it all. No one. 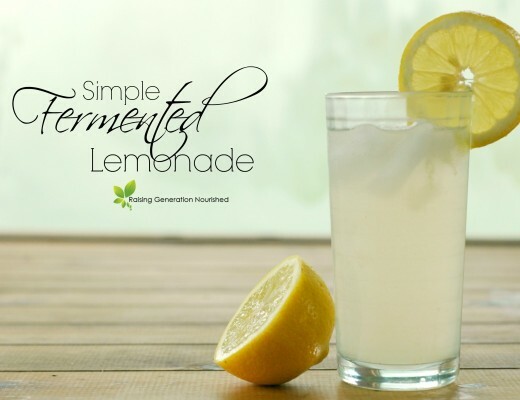 So even if you never try the recipe in this post today (I hope you do! ), please walk away from reading this post feeling a sense of hope. You CAN do the real food thing not only on a budget, but on a time crunch. And it is so worth being able to get through your day with that much greater ease because your body is nourished with food that fuels. Did you hear that part? 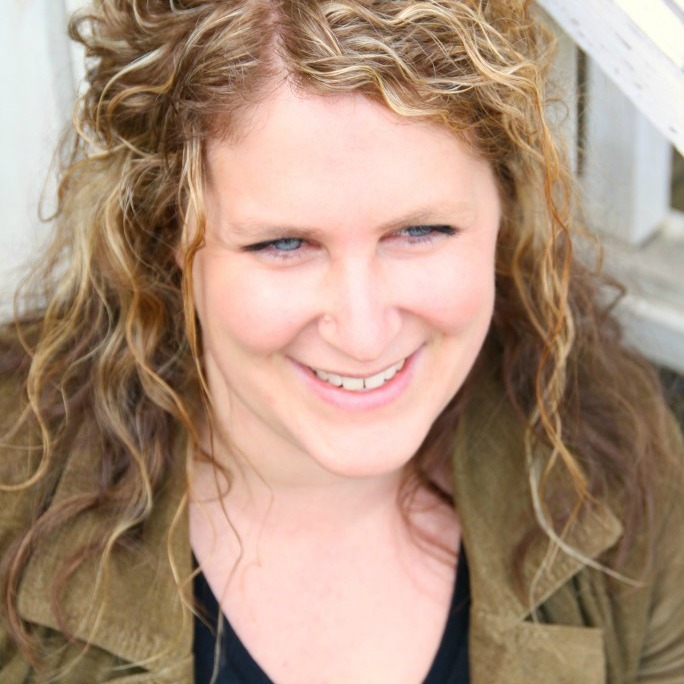 I didn’t even mention your kids…yes nourishing the kids is great (and so important so they can get through their day too! ), but YOU dear momma. YOU need to be fueled because this ship sinks without you being well. 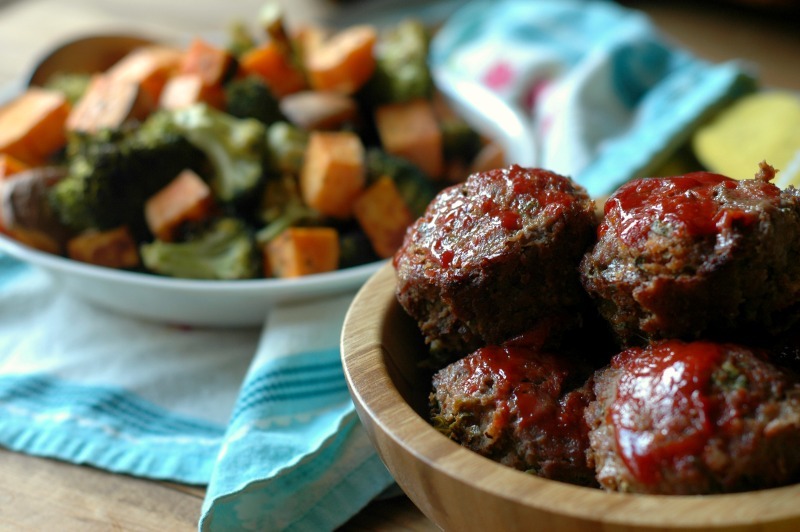 The ultimate nutrient dense dinner…meatloaf! It is no secret, my family is obsessed with my meatloaf recipe. My husband, in particular, favors it over most any dinner I make. This momma loves that it is packed out with nutrient loaded grass-fed beef AND liver and that it is happily gobbled over and over. A weekend dinner made for the weekday! My meatloaf recipe is so good, but I’ll be the first to admit, that it is more of a weekend meal. Especially when you want to go the extra mile and make special sides like really amazing mashed potatoes. On weekdays, I need quicker prep time, quicker cook time, and just over all less fuss. Quicker prep time, cook time, and less fuss? How can that be for a meatloaf dinner?! I’m so glad you asked! Less fuss with prepping the meat. While I love the flavor that the cooked mirepoix gives in my original meatloaf, it does take some extra time and steps that a weeknight just doesn’t call for. Instead, I packed these little guys out with amazing flavor using seasoning you probably already have in your pantry, and it makes the meatloaf taste really yummy. Less cook time. One-third of the cook time to be exact! Pop everything into the oven for 30 minutes while you help the kids with homework, play a game, give the baby a bath, or read books to the toddler and dinner is done! Super hands free! Quicker veggie sides – but still kid friendly! I think it’s pretty safe to say most kids will accept sweet potatoes on their plate – especially when they are roasted sweet, and have tasty seasoning. But you can change up the veg to what your kiddos love too! Sheet pan veggies are super fast and kids love the taste. Ok, so I get it. 30 minutes is still 30 minutes, right? So this meal probably doesn’t work on that 2 hour gymnastics practice night, or the night you work late and the kiddos are one their own, or the day you have a fussy, teething baby or sick, needy toddler. But this definitely works for most run of the mill weeknights, *especially* if you do just a little prep work the night before! Get the meat into the pan the night before. Mix it up, divide it up, cover it up, and stick it in the fridge til it’s time to cook! Or, prep the meat into servings and freeze big portions. Put this on your prepday and triple batch! That will make 3 dinners for the next month! Simply freeze the mini loaves and pop them into a freezer bag. You can pull out however many minis you need for dinner that night, thaw them, and cook. Chop the veg the night before. It’s one of the reasons we eat sweet potatoes over white potatoes more often – they don’t brown, so I can prep them ahead! 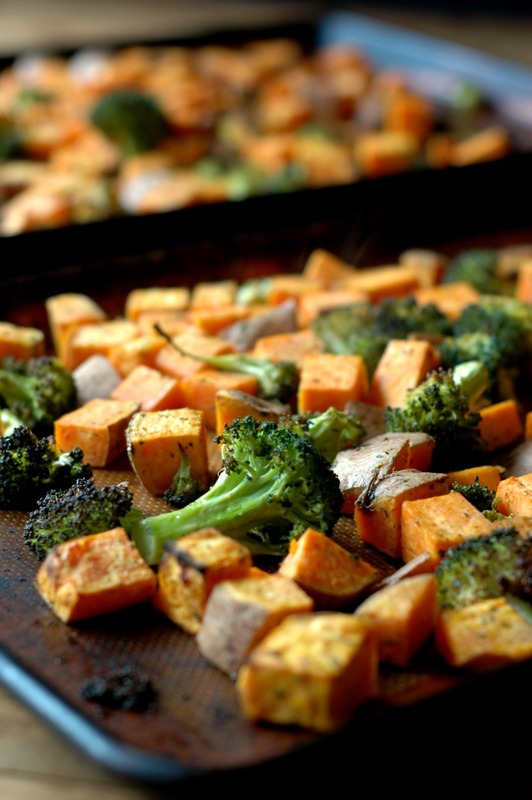 Chopping the sweet potatoes and broccoli the night before will save you at least 5 to 10 minutes of prep time. On dinner night, just dump them onto your trays, oil & season them, and they are ready to go! Use leftover roasted veg from the weekend or night before! Seriously, I do this all the time. When I’m cooking one meal, I might as well double it up I figure. I can use the leftover veggies for my breakfast or dinner the next day. Prepare the veggie trays. Toss the sweet potatoes and broccoli florets in a large mixing bowl with the oil and seasonings, and divide between 2 sheet pans. Prepare the mini meatloaves. Mix all the meatloaf ingredients together by hand in a small mixing bowl. Divide the mixture into 6, and distribute the meat into a half dozen muffin tin. Spread ketchup on the top of each mini meatloaf if you wish. Roast everything together at 425 degrees for 30 minutes, stirring the veggies around at the halfway point. 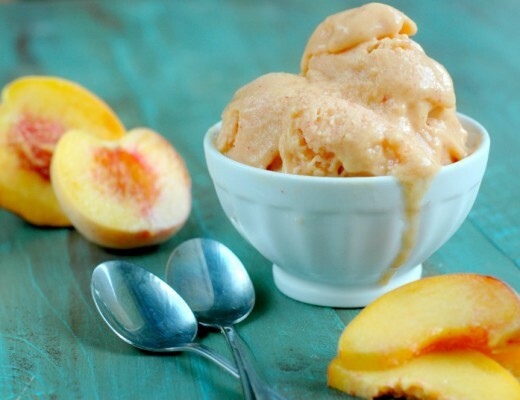 Dairy Free Peaches and Cream Sherbet :: No Ice Cream Maker Needed! So much YES to this meal! My husband loves meatloaf and I love how all of this meal comes together so quickly. I can’t wait to try these mini ones soon. 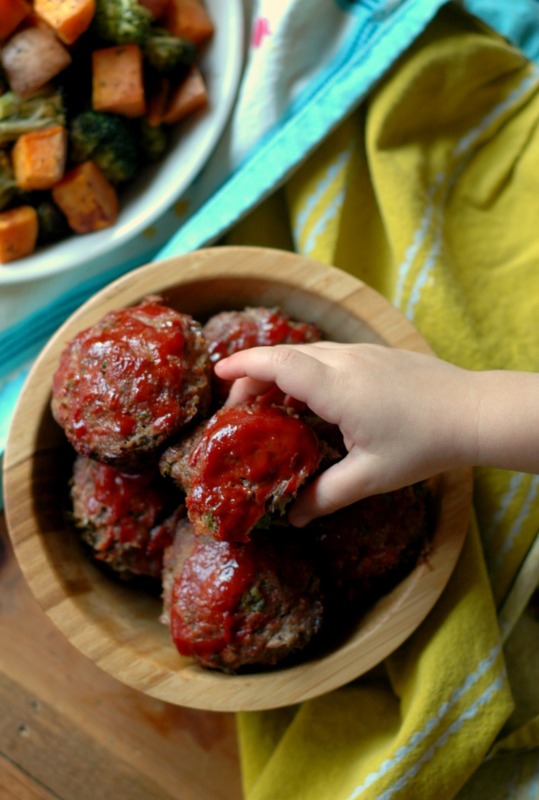 How cute are these meatloaves! I love how easy they are to make as well. Such a great weeknight meal! Omg this is genius using the muffin tin! I’ll be trying this for sure. Aww Linda LOL! You are definitely not a bad wife! I love making Mini-Meatloafs! Seriously, the perfect make-ahead for when I want to do a lazy dinner. My kids love meatloaf! What a great idea to make it in a muffin pan. I am definitely going to try this out! 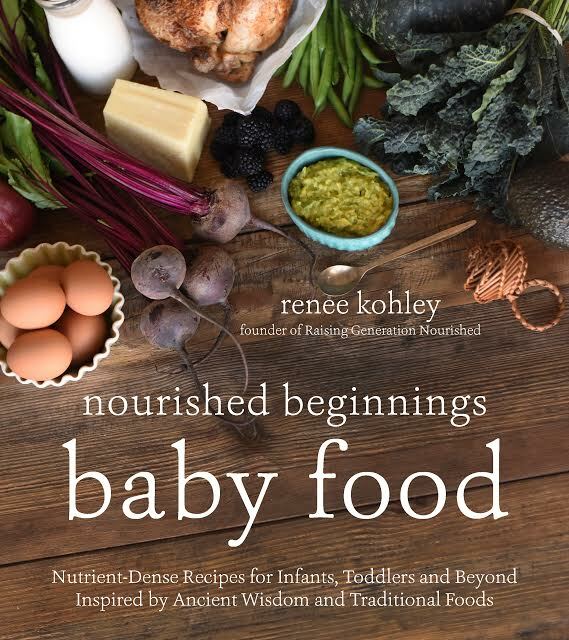 You have the BEST ideas for easy meals, Renee! 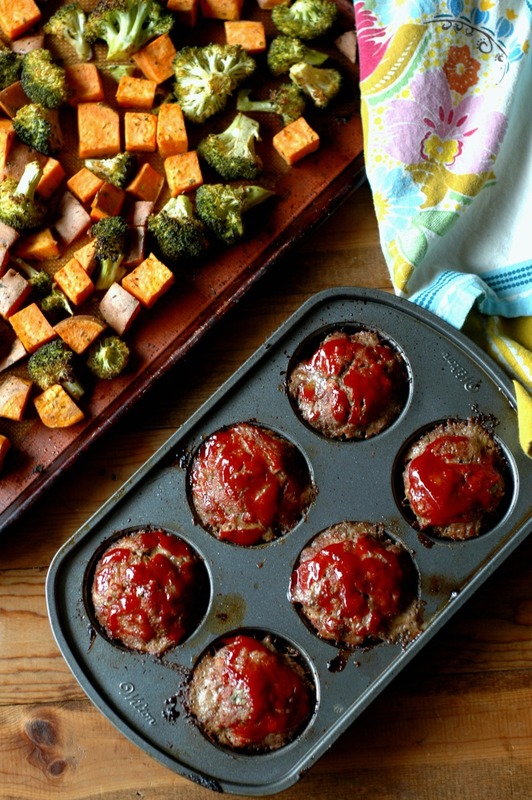 These mini meatloaves look so good! I love all your ideas for making it easier the next time, prepping extra veggies and doing some of the work the night before. And love the liver in there! 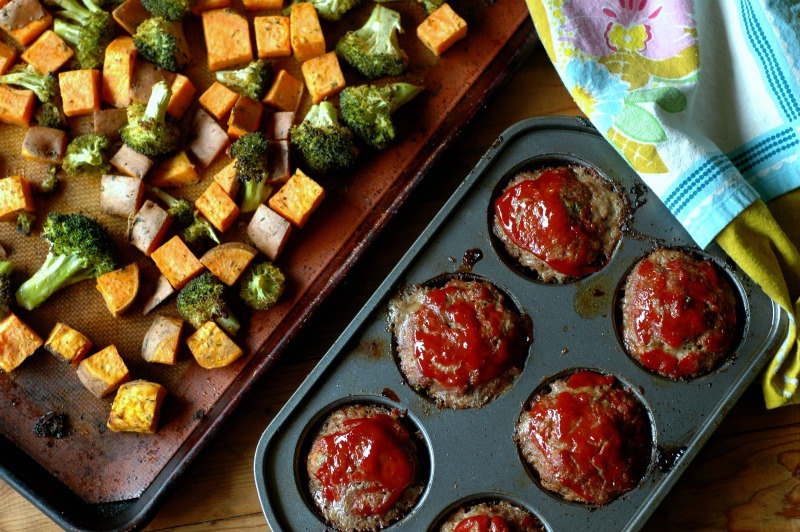 Meatloaf is so satisfying, and your little ones with roasted veggies are perfect. I’m all about 30 minute meals right now, there’s just so much going on that quick and tasty dinners are a must! 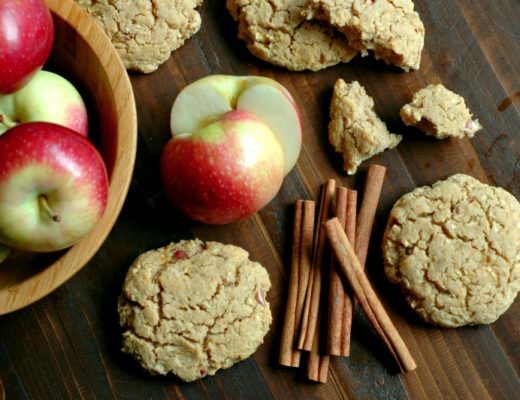 My kids would love these – thanks for a great recipe – going to give this a try. Mini meatloaf sounds like it would make a great weeknight meal! Love those roasted veggies, too! 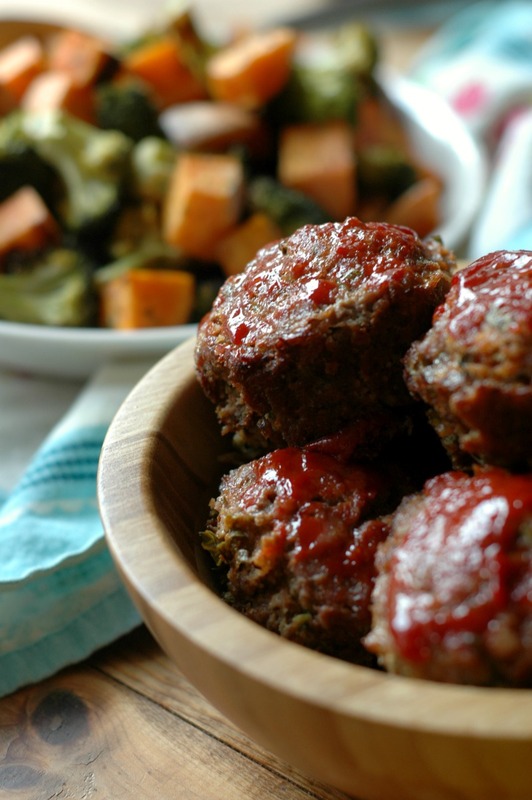 Love these put it all on the oven dinners and LOVE the kale in the meatloaves! Such a VEGGIEFUL meal! OMG! This is such an incredible idea! I want to make these for boyfriends lunch. Totally delicious and fantastic. Love when you can multi-task in one oven ! YESS! Fill those mama cups, and make sure you are getting nourished! Could ground turkey or chicken be easily substituted? I love mini food. And these look easy to make and delicious. Thanks for the recipe! My husband loves meatloaf and these minis are so cute!! Hi! I love your recipes. I am wondering what size sheet pan you use? Or if you have an Amazon link for them? Thanks!